Get up Close & Personal with the Jungle while Paddling Along the River! The Safari Float tour is set on the Peñas Blancas River that runs through the Tilaran Mountain range, 30 minutes east of Arenal Volcano. This is a perfect half-day excursion for families and groups looking for a peaceful wildlife experience on an inflatable raft through the rainforest. When you arrive at the river bank, your professional bilingual guide will get you ready to enjoy two hours on a completely relaxing inflatable raft trip that takes you along the river where you can discover the sights and sounds of the rainforest. Experience the peacefulness of the jungle as you quietly paddle along the Peñas Blancas River. Spot an array of tropical birds such as toucans and kingfishers, as well as lots of animals like monkeys, sloths, poison dart frogs, caimans, and iguanas! Your naturalist guide will help you spot those hard-to-see animals. This tour is available as an adventure connection when travelling between the Arenal Volcano area and San Jose. 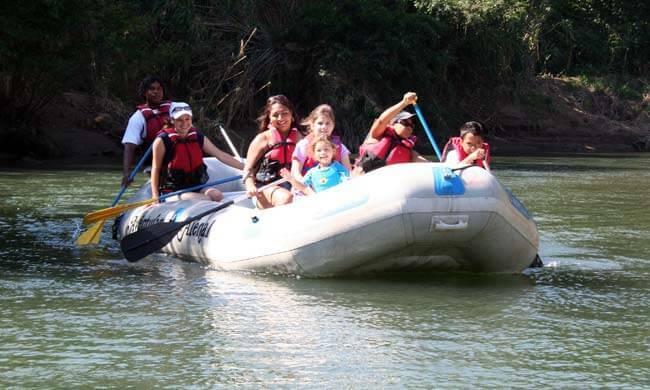 If traveling between Guanacaste beaches and Arenal or Monteverde, this tour is available on the Tenorio River. Inquire for details and pricing! Tour includes: Transportation from/to your hotel, naturalist guide, fruits, water, sodas. What to bring: Comfortable clothes, sandals, sun block, repellent, camera, binoculars, towel, raincoat.